If you read this blog at all, you know I'm a huge supporter of shopping and eating local. This is why I haven't eaten at a lot of the really popular chain restaurants. 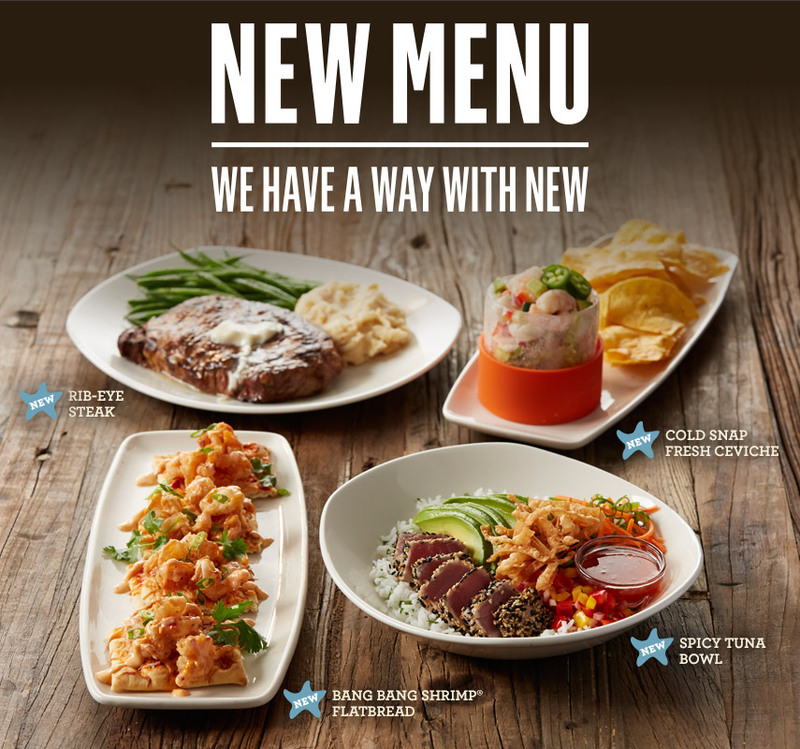 Recently Bonefish Grill approached me about their new menu and I initially wasn't interested. But after looking at the menu I was intrigued. It looked really good and many people I know like the restaurant so I decided to give it a try. When we arrived the placed was PACKED! And it was a Thursday night. If all these people were there, it had to be decent, right? Let's just say I was pleasantly surprised. 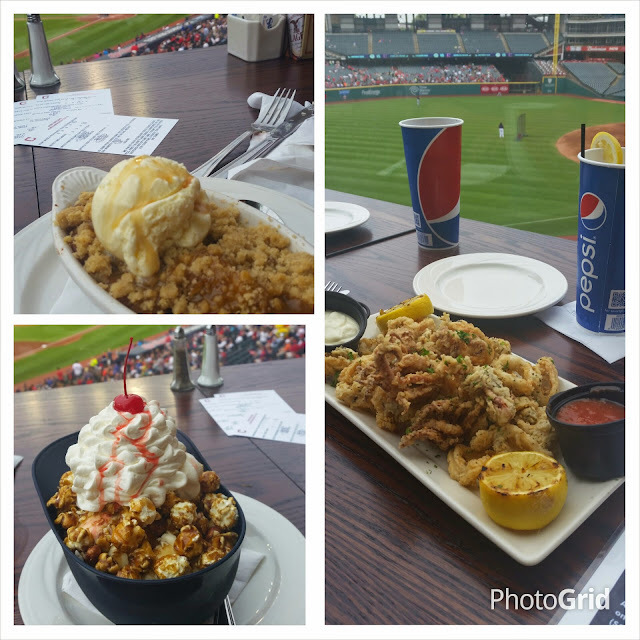 It's definitely not the same as eating at one of my favorite local establishments, but overall we enjoyed our meal. With a few tweaks, they could be excellent. 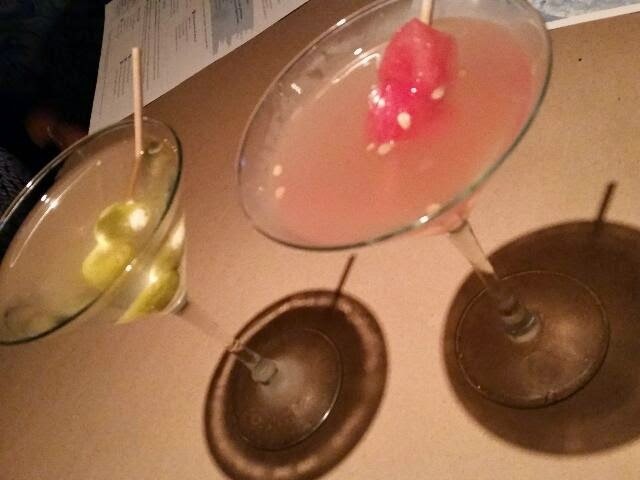 We chose some cocktails - a dirty martini made with citron vodka and a watermelon martini made with cucumber vodka. Both were good. They froze the watermelon balls which is a great idea because it helped keep the drink cold. The only drawback is that the fruit tasted like frozen fruit then. 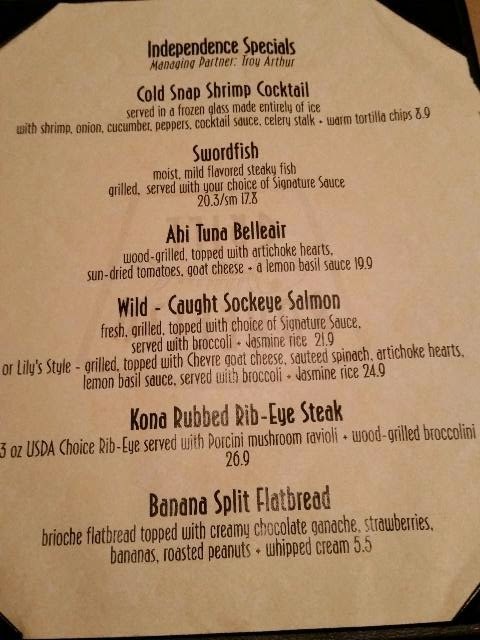 I was specifically looking for the menu items labeled "new" and a lot of them sounded delicious: cold snap fresh cerviche, lobster grilled cheese served with lobster bisque, and bowls filled with your choice of seafood, steak or fire roasted veggies. But one of the specials caught my eye - sockeye salmon lily style with goat cheese, spinach, artichoke hearts, and lemon basil sauce. The salmon was wild caught, perfectly cooked and delicious. I loved the fresh spinach in the sauce. 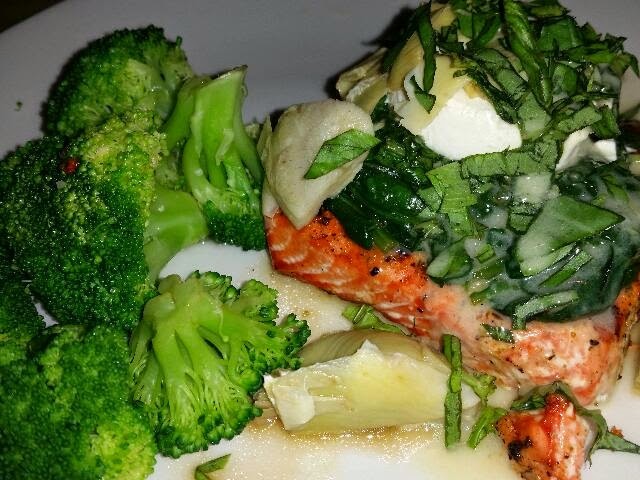 I never order salmon out because I'm so often disappointed so I was very happy I took a chance and ordered this dish. I substituted the new crab fried rice for the jasmine rice for an additional $4. The first fried rice came out swimming in oil. I advised the server who initially stated "but it's healthy olive oil" but thankfully redeemed himself by bringing out a fresh serving that was grease free. It was a small portion but absolutely delicious. The seasonings were flavorful and I like the addition of tiny pieces of crab. I would love to eat this as an entree with larger and more plentiful pieces of crab. 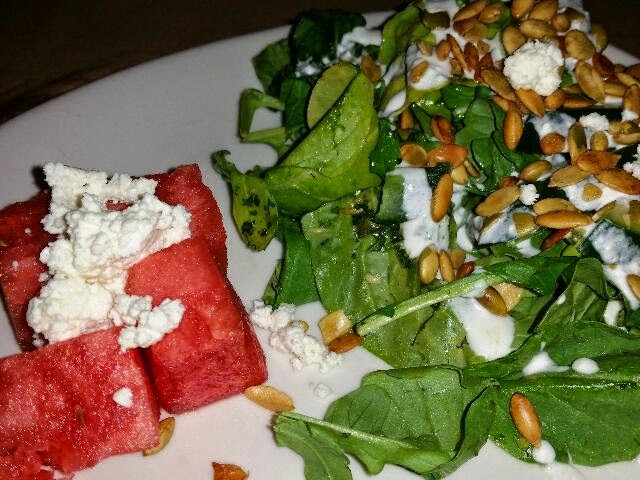 My hubby and I split the water melon salad. It was marred by lettuce that was not washed properly. There were lots of yucky pieces of lettuce throughout our salad and our friend's too. It's a shame because it was really good. This is another example of where attention to detail could have elevated this to an outstanding dish. 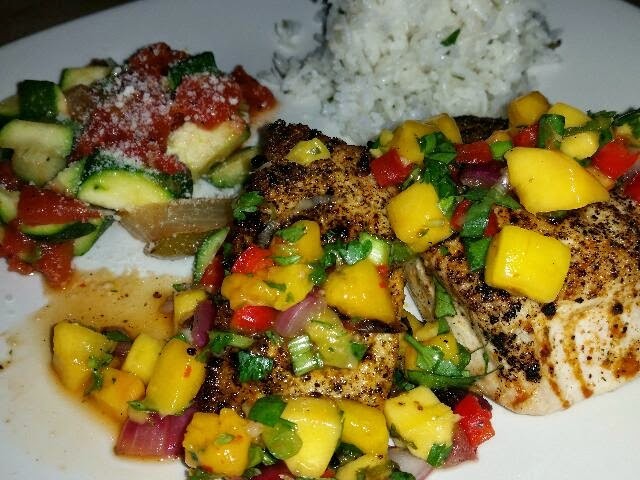 For his entree, my husband selected the swordfish special and chose the warm mango salsa as his signature sauce. It was a colorful and tasty dish. The fish was really fresh and he enjoyed the fresh zucchini medley that came as a side. We were unfortunately stuffed by the time we were done so we had to skip dessert. There were so many items that sounded good - s'mores flatbread, Jamaican coconut pie with rum sauce, key lime pie and more. Overall, I think that Bonefish is an above average chain restaurant. The menu is full of interesting choices for seafood and meat lovers and vegetarians too. Leave a comment below telling me what you would order if you win. You can also get a bonus entry by Tweeting about the giveaway, tagging me and @BonefishGrill in it and leaving another separate comment and telling me you did. That's it! Be sure to leave your name and a way to contact you. If you don't, you can't win. Giveaway ends Sunday the 7th with the winner announced the following day. Good luck! 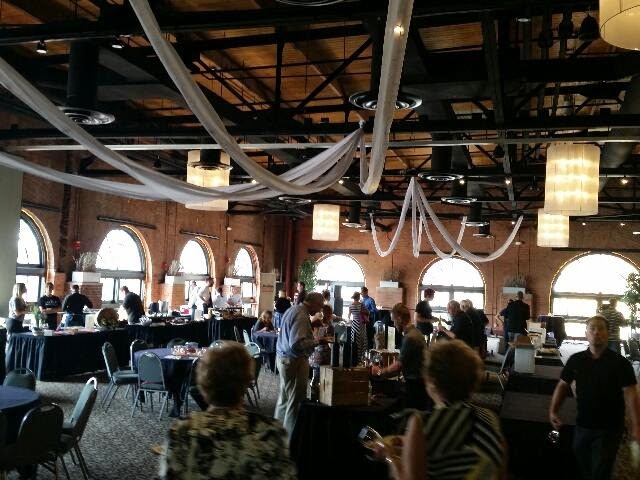 I recently attended Locavore - the National MS Society's annual fundraiser at Windows on the River. I hadn't been to this venue in a really long time and I was reminded of why people love to hold events here. The views were so pretty looking out over the Cuyahoga River! 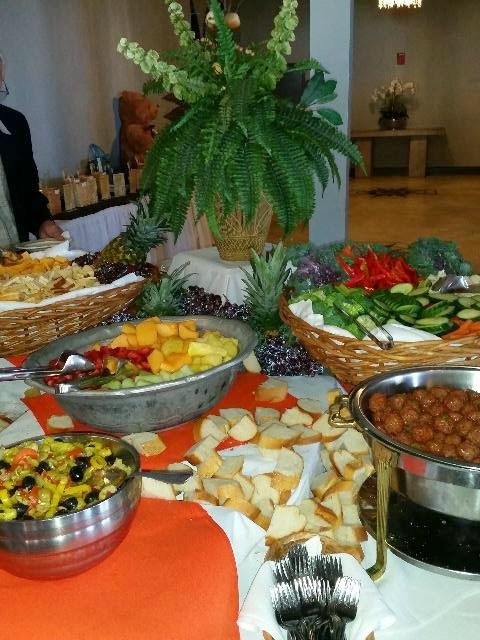 As soon as we walked in, we were greeted by a lovely appetizer display including a nice assortment of cheeses, fruits, veggies and meatballs. 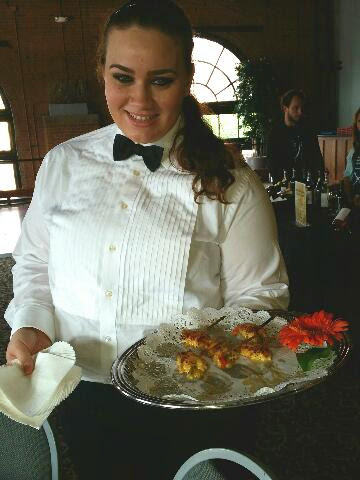 They also had servers roaming the room offering up bruschetta, spanikopita and these really delicious bacon wrapped chicken bites. We decided to stick with food before sampling the many wines since we hadn't eaten since lunch. There were a couple of savory dishes and four sweet treats to choose from. As usual, Jeff Jarrett of Amp 150's dish stole the show. His Variety of Corn, or Corn x 4, was so simple, yet so tasty. 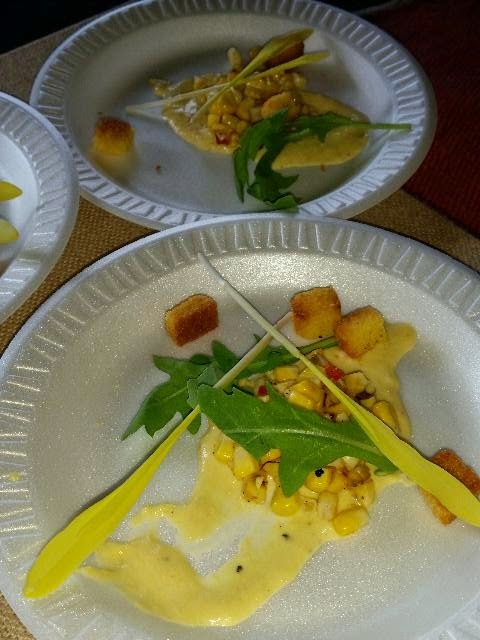 Corn puree, corn salsa, corn shoots and corn bread croutons made for one delicious dish. We were really excited to see what Urban Farmer had to offer and were not disappointed. 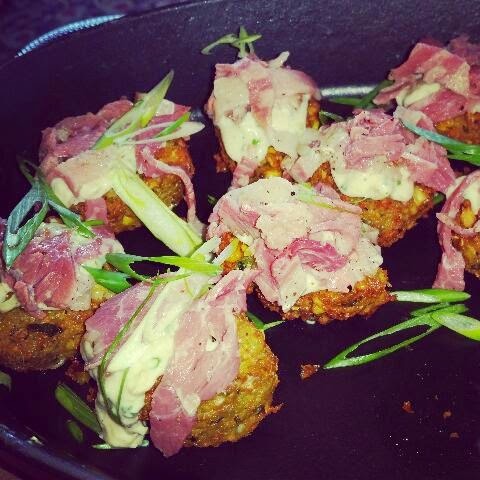 Their sweet corn falafel with pastrami was a fun way to show off their house cured charcuterie. 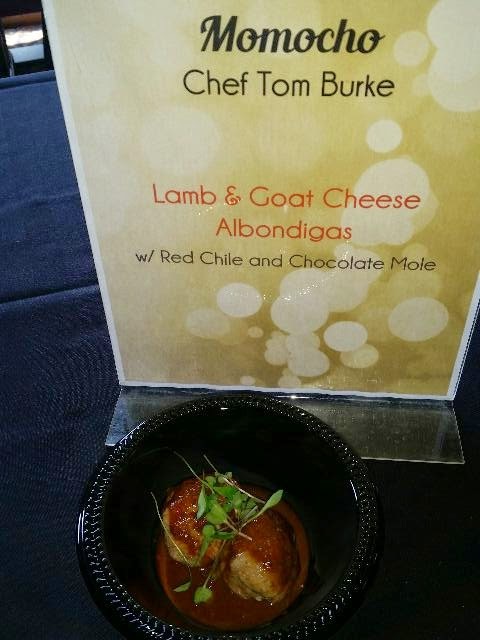 Momocho's lamb and goat cheese albondigas were delicious meatballs in a savory sauce with a Mexican flair. Jack Flaps SOS didn't LOOK very good but was an upscale version of a diner classic. 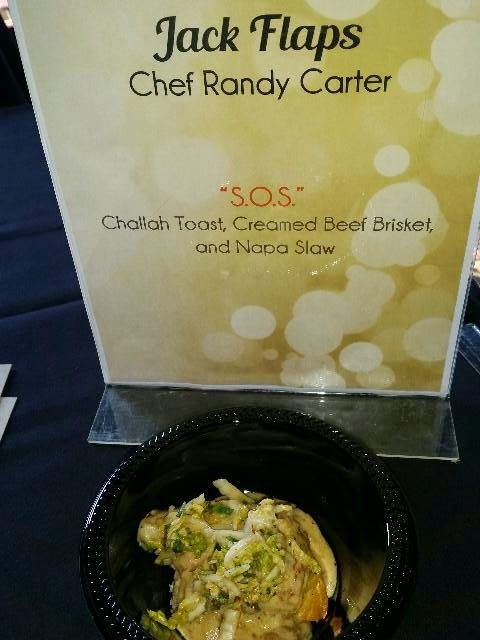 I loved the addition of the slaw and the crunch it added. The Driftwood Group showed off one of their newest additions, Bin 216. I haven't been to this restaurant yet so I was excited to try their dish. 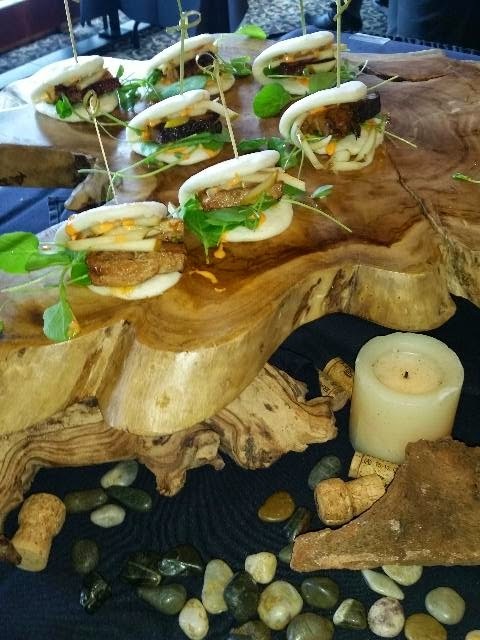 The pork belly steam bun was similar to those at Noodlecat and were delicious. 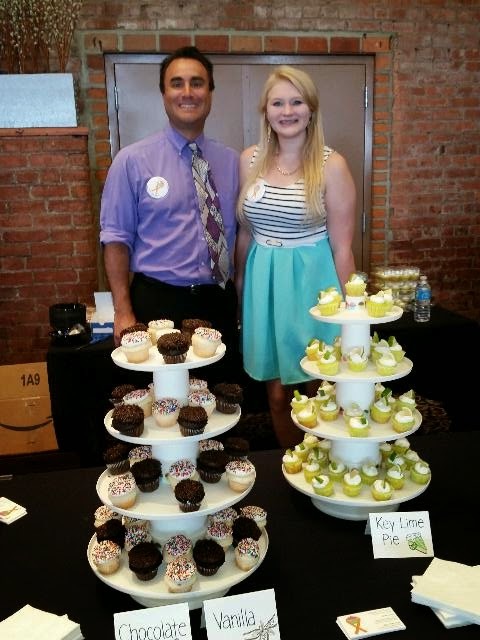 Cupcakes by MS Cupcakes for a Cause - this 16 year old puts her baking skills where her heart is - all profits are donated to the MS Society. And they taste great! I'm a HUGE ice cream fanatic but ice cream and wine aren't my favorite combo and three of the five choices were ice cream based. 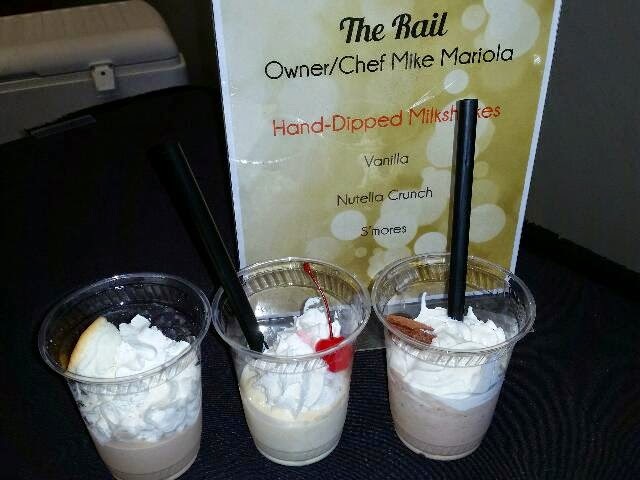 The Rail's Milkshakes were popular but I was secretly dying for one of the burgers. Mitchell's ice cream and Sweet Spot gelato rounded out the desserts. Both were excellent as always. Mitchell's featured their delicious fresh peach ice cream - it's currently at the stores so if you haven't tried it get there soon. There were too many wines to try them all. Our local wines have really improved in the past decade and there were a lot of delicious offerings. My favorites of the nice were from M Cellars. A Geneva new comer, their reds were great! There is a great event coming up next month. On September 13th, the Polo Fields in Gates Mills will be transformed into a festive food filled party with an equestrian flair. Chefs Unbridled is the annual benefit for Fieldstone Farm Therapeutic Riding Center that features local chefs serving up a cocktail party under a giant decorated white tent. 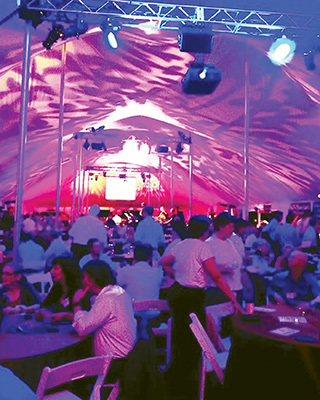 The Cleveland Jazz Orchestra will be playing as you sip and nibble. There will be appetizers, food stations and several food trucks to sample from including Hodge Podge. I volunteered a couple of years ago and had a great time. It's a unique venue and even includes horse drawn carriage rides. The event is the Center’s primary annual benefit to raise money for riders with special needs. This event is sure to be a sell out so get your tickets while you can. Ticket prices begin at $125 and include a tax deductible donation to Fieldstone Farm Therapeutic Riding Center. For tickets contact Maureen Foster at 440-708-0013 ext. 123. To learn more about Fieldstone Farm Therapeutic Riding Center go to www.fieldstonefarmtrc.com. It's been a lucky month for me. 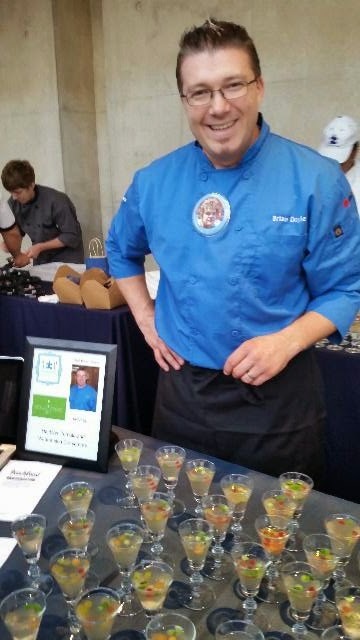 I recently won tickets to the Autism Speaks Chefs Gala from the fabulous Cleveland Chick. I found out at work and I literally had to control myself and not jump up and down. Who wouldn't be excited about getting to eat food from tons of great #CLE chefs. You throw in our local super star Michael Symon and Mario Batali and it's sure to be an extra special bash. And it was. There was so much great food - you could tell that the chefs all wanted to make something extra special for the occasion. The museum was gorgeous and So. Much. Yum. Her lamb polpette (meatball) was juicy and packed full of flavor. We really loved the sauce and the crunchy za'atar pita chips. The smoked yogurt, feta and Cornichon complimented the lamb perfectly. I would love this as an entree. WOW~ this Goat Cheese Sundae was a stunner! 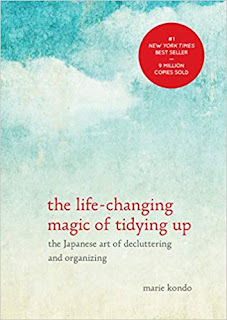 Gorgeous, super creative and soooo good! The touch of micro basil was a tasty surprise. I wish this was on every menu in Cleveland! Jeff is consistently one of my favorite chef's in CLE. He never disappoints and makes me like things I swore I never would. LOVED the Bison Tartare with Duck Egg Gribiche (fancy egg salad,) shiso puree and spiced salt. 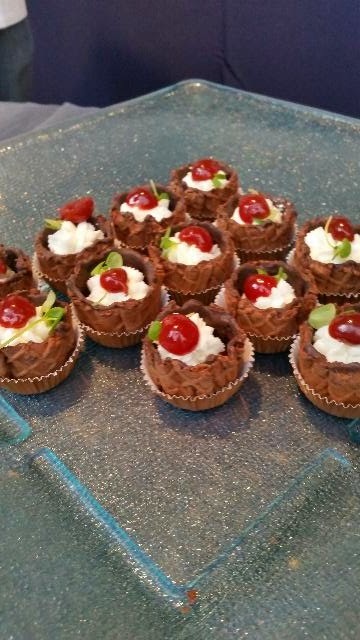 This tart was a huge hit. The fig and duck confit took this tasty treat to a whole new level. The portion was HUGE but that didn't stop us from eating every last bite. This Scallop Crudo with grapefruit, edamame, cucumber and mint oil was soooo fresh and light - perfect for a summer night. Eggplant Meatballs - these were like arancini without the rice and were loaded with eggplant and cheese - delicious! Strangolapreti alla trentina - Bonus: click here for recipe! 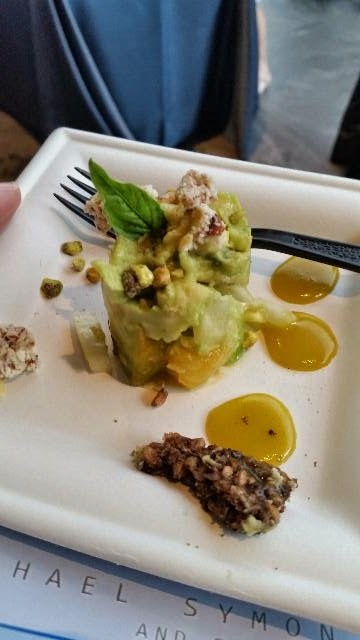 The highlight of this dish was the Basil Avocado Gelato. Swoon! He also made citrus crusted tuna. Chilled tomato soup - "not gazpacho!" Tim Bando - Grove Hill - This is the a dish we didn't try because it was corn on the cob. No way was I even touching that in a cocktail dress. Too bad because it looked great! John Selick - University Hospitals Ahuja Medical Center - blogger fail - no pic! 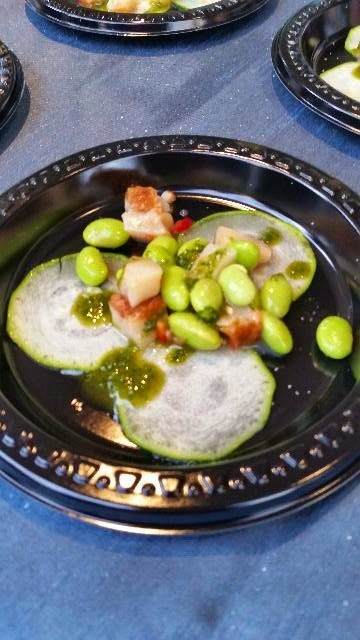 Of course the hightlight for many was the Chew-like cooking demo by Chefs Symon and Batali. I wish they would have had a screen up to show what they were doing but was glad to get to sample their recipes. Too bad this was served cold because it sounded so good! One of the best parts about the night was getting a booklet of all the recipes. 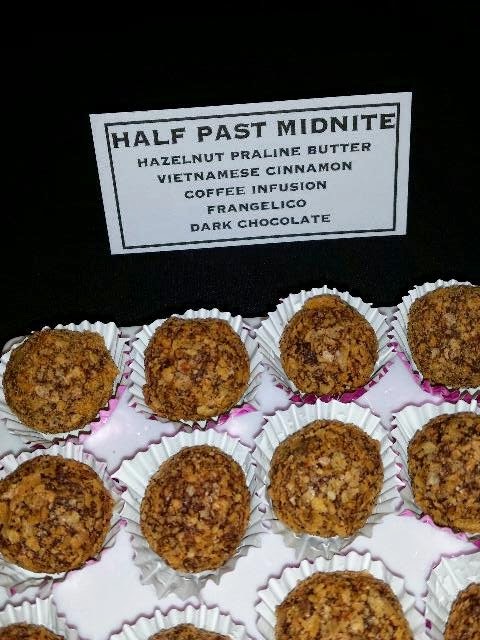 They also provided a parting gift of chocolates from Fears Confections. If you missed the event and still want to donate, click here. Last week was a great week for the Indians. They unveiled their plans for an upgraded fan experience next year. Lots of changes are coming to the ballpark including a revamped Gate C, new local all-star food choices, places to hang out with your friends as a group and more spaces for the kiddos. 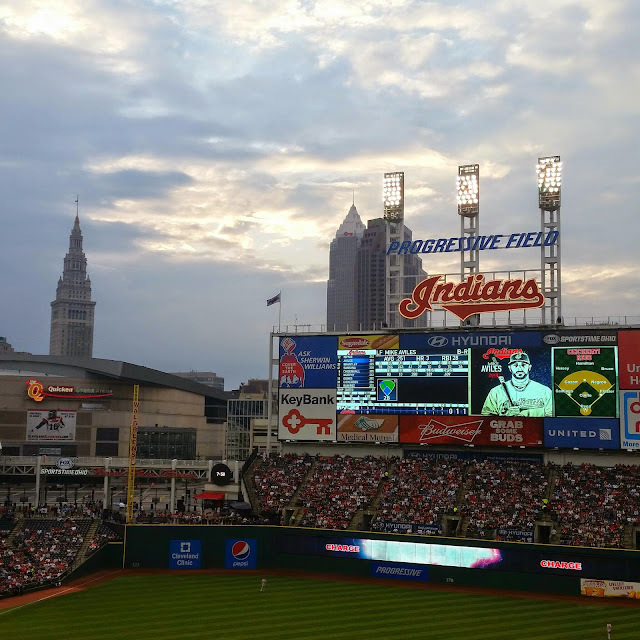 You can read all about their Progressive Field Evolution plan here. It was also a great week for this Indians fan. 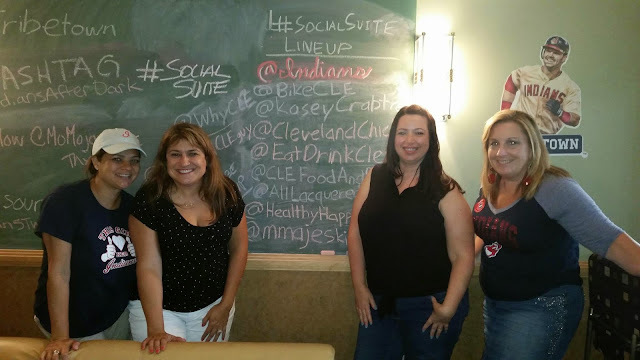 I was able to get tickets to the Social Suite and was also invited along with a group of bloggers to dinner in the Terrace Club. 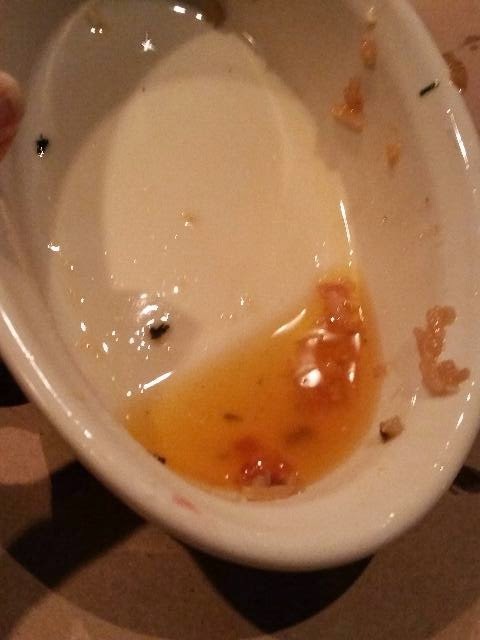 They wanted us to try a new appetizer and provide feedback. And what an appetizer it was! 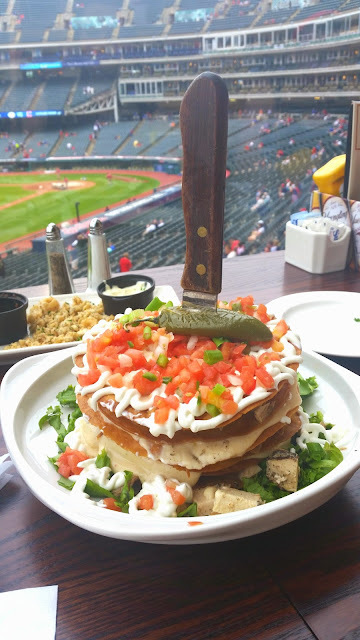 The Terminal Tower Nachos could easily be a meal and definitely should be shared with friends. It's a giant stack of crispy flour tortillas on a bed of lettuce and layered with pulled pork, queso, and grilled chicken drizzled with sour cream and sprinkled with chopped tomatoes and green onions. It was topped with a whole jalapeno and speared with a knife. Wow. It makes quite the impression when it's brought to the table and was really delicious. The tortillas surprisingly held up really well and didn't become soggy. My suggestions were to offer a spicy version with hot peppers and hot sauce on the side and to add beans. I think that this would be a great addition to the Terrace Club menu. 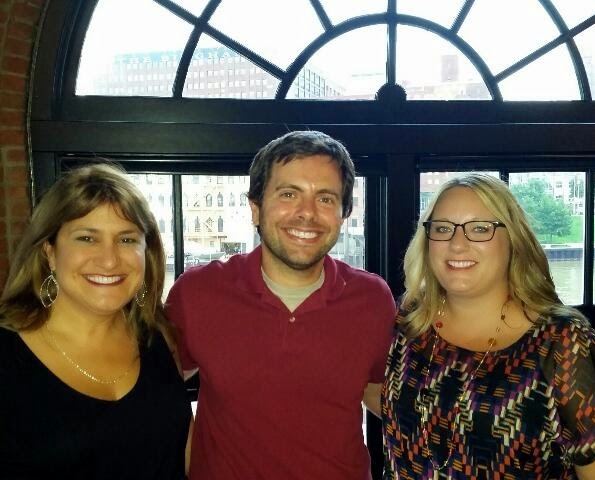 Thankfully we split the Terminal Tower Nachos between six people because we also were there to eat dinner. We split an order of calamari and then had the buffet so we could get a full taste of what the Terrace Club had to offer. What a feast! It's been a LONG time since I've eaten a meal at the Terrace Club and I was really impressed. Fresh fruit, an impressive assortment of cheeses, grilled veggies, salads, and entrees included something for everyone. They even had a build your own Reuben bar - what a great idea! I'm totally stealing that idea for a party. And when you go, be sure to save room for dessert. I ordered the caramel corn sundae - so good! The apple brown betty was also tasty. The portions are large so plan on sharing. 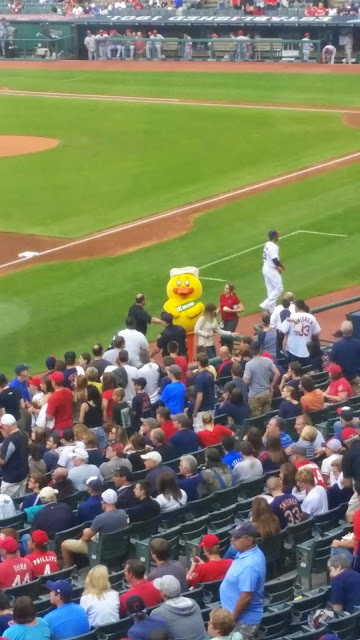 After the Duck Tape Duck threw out the pitch to Slider, it was time to play ball. 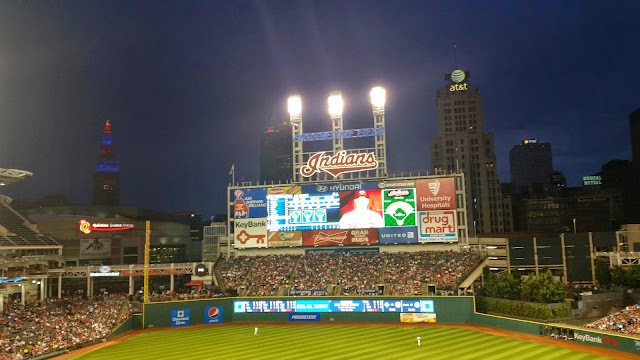 Because it was Duck Tape night, the 1st 10,000 fans to leave received Indians Duck Tape. While I can guess why they handed out the tape as fans left, I don't like how it rewarded fans who didn't stay until the end of the game. 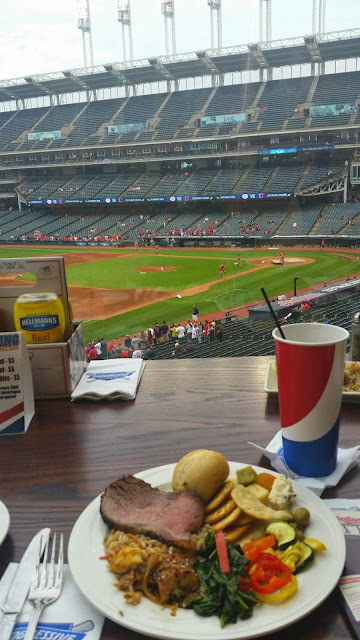 We were reluctant to leave the Terrace Club because we had an awesome view of the field, but we didn't want to miss the fun of the Social Suite. It also includes a great view. It was a beautiful night for a ball game. It did rain a little bit towards the end of the game but it didn't spoil the fun. And were sure to snap some photos for heading home. 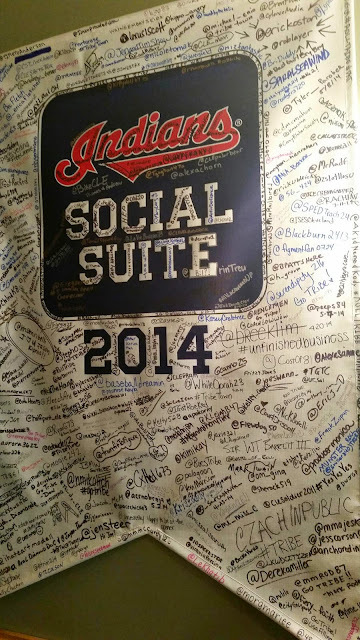 My 2014 visit to the Social Suite was super fun as always. If you would like to try to snag an invite, you can apply online here. And of course a big thank you to the Indians for the invitation!